The Massachusetts Department of Transportation is negotiating to move its downtown Park Square offices to a $350 million development in Roxbury, a blockbuster deal that could shake up the real estate markets in both neighborhoods. The Boston Redevelopment Authority on Thursday was scheduled to take up a land transfer that would pave the way for construction of a new State Transportation Building in the long-delayed Tremont Crossing project near Dudley Square and Ruggles Station. That would free up its current headquarters at the heart of Park Square. The block-long Transportation Building is likely to trigger huge interest from the city’s real estate community. Emerson College has already said it would like to acquire or lease space in the massive building. Meanwhile, the state agency’s relocation to Tremont Street, across from the Boston Police Department headquarters, would offer a huge boost to steadily unfolding efforts to revitalize Roxbury. In addition to helping fill parcels that have been vacant for decades, the transportation building would bring thousands of office workers to the neighborhood, at a time when several developments would add dozens of retail stores, several hotels, and hundreds of homes to that section of Roxbury. Governor Deval Patrick has been trying to finalize the deal in the waning days of his administration. A spokesman for Governor-elect Charlie Baker said the incoming administration is aware of the proposal and generally supports the idea of moving state offices to support development in struggling parts of the city. Several major projects are already moving forward in Roxbury, including construction of a science and engineering building for Northeastern University and relocation of the Boston School Department to a remodeled commercial complex at the heart of Dudley Square. Other major projects are planned along Melnea Cass Boulevard and at a former bus yard on Bartlett Street. But the Tremont Crossing project would bring the most sweeping change to the area in decades. The development by Feldco Development Corp. and Elma Lewis Partners would revitalize 7.25 acres of parking lots and vacant land that is now a dead zone between the South End and Dudley Square. 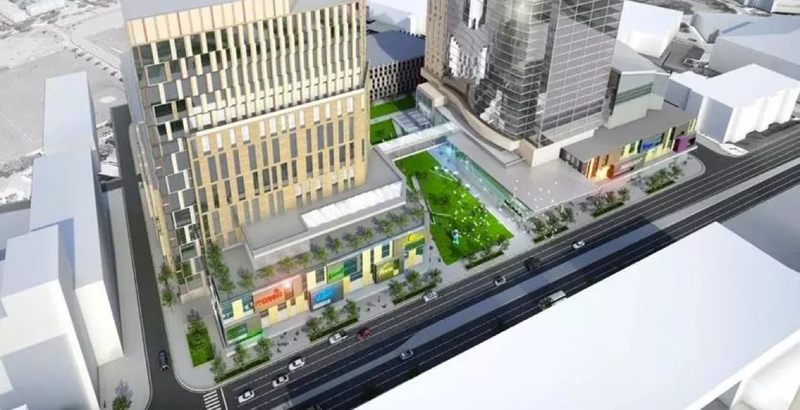 MassDOT would occupy up to 800,000 square feet of office space in the project, which would also include a hotel, 300 residences, offices, and 350,000 square feet of retail and restaurant space. It would probably take several years for the new transportation building to be constructed. BJ’s Wholesale Club has committed to anchoring Tremont Crossing’s retail space with a 90,000-square-foot store. The project would also include a museum for the National Center of Afro-American Artists, two public plazas, and a 1,500-space parking garage. The Tremont Crossing project has suffered fits and starts over the years. The developers were close to striking a deal to host a new regional headquarter with Partners HealthCare, but a year ago Partners opted to move to the Assembly Row development in Somerville. Negotiations to bring MassDOT to the property have been going on for several months. A law signed by Patrick on Oct. 31 signaled the state could be gearing up to sell its downtown property. The law calls for the transfer of ownership from the Division of Capital Asset Management and Maintenance to the Department of Transportation. The transfer ensures that if the property is sold, the revenue would go to the cash-strapped transportation agency, which would need the money to help pay for the new Roxbury headquarters. An item on the agenda for the BRA’s monthly board meeting proposes a land swap with the Transportation Department that would allow it to move to the Tremont Crossing location. The agenda does not indicate what land the agency would get in exchange. BRA officials declined to comment. When it was constructed in the early 1980s, the Transportation Building was meant to spur private investment at the edge of the old “Combat Zone,” which contained numerous drug-infested bars and strip clubs. Though the transformation did not happen immediately, the eight-story red-brick facility now sits at the center of a bustling neighborhood that includes hundreds of luxury condominiums, renovated theaters, and hundreds of new hotel rooms. The city’s Assessing Department values the Transportation Building at $121 million, though it would probably sell for significantly more. State transit agencies have the largest presence in the building, with some 1,600 MassDOT and MBTA employees working there. The facility also has office space for other state government workers, and Emerson rents a small amount of space in the complex.